It’s a good time to buy a used car. Millions of previously owned cars and trucks are flooding the market as leases expire and customers look to upgrade. Prices have fallen since the start of the summer, and inventories are climbing. It’s a delayed reaction to a recovering auto industry: When credit loosened two or three years ago, it became easier to lease a car. Now those leases are coming to an end, and car buyers are flocking to dealerships to turn in their now-used vehicles. While analysts predict supply levels are still years away from pre-recession numbers, they say the used-car market should continue to rebound through the remainder of the year and into 2015. The average used car sold at a franchised auto dealership for $10,963 in September, down about 2.1 percent from a year ago, according to CNW Research. Although the September average is 0.7 percent higher than August, prices had fallen every month before that since May. 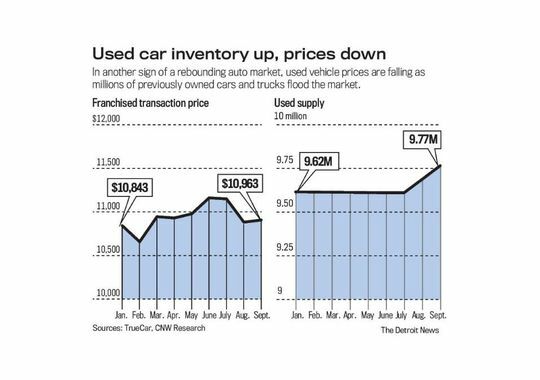 Concurrently, used-car inventory has risen for the past three straight months; it was up 1.5 percent in September compared to the same month a year ago, according to TrueCar. About 9.76 million used cars were available in the U.S. in September, compared to about 9.62 million last September. The number of certified pre-owned vehicles — those inspected and deemed worthy to resell by manufacturers — are on the rise, too. AutoTrader.com said the supply of those has increased 6 percent in the past six months. “The last quarter of 2014 will be a great time to get a good deal on a used or certified pre-owned vehicle,” said Michelle Krebs, senior analyst at auto research site AutoTrader.com. Lower prices and better supply have led to an increase in used-car sales nationwide: Through September, used-car sales were up 3 percent over the same period last year to 28,805,863, according to TrueCar. During and after the recession, used-car prices soared and inventory dropped as fewer people bought new cars, which eventually led to fewer used cars being turned in. Now, the market is shifting back on the heels of robust new-vehicle sales. Automakers sold 1.2 million new cars and trucks in September, a 9.4 percent increase from a year ago, and analysts have predicted the annual rate of sales could reach 17 million vehicles in the coming years. Sales have been steadily rising since 2010 after falling to 10.6 million in 2009. Last year, sales were 15.9 million. The used-car trend does have downsides, industry analysts say. Because supply is high, selling a used car is harder than in years past. Manufacturers will also start charging higher lease rates, since resale values will drop because of the the high inventory and low prices. Analysts are split on if the used vehicle market will affect the strong sale of new cars and trucks. TrueCar’s Dominique said the high inventories could “add a level of challenge” to new vehicle sales, but AutoTrader.com’s Krebs said it could actually help. Milnes has AWESOME prices on pre-owned! 2014 Taurus SHO AWD – #P2087 Certified Pre owned 12/12 warranty! Heated seats/steering wheel, remote start! MSRP $41,800. Sale price $29,500. Save $12,300! 2014 Chrysler 200 Touring – #2080 Flexfuel V6, Power driver seat! Sale price $13,900! 2014 Escape SE 4×4 – #P2081 2.0L Ecoboost, Rearview camera! MSRP $28,495 Sale price $19,900! Save $8,595! 2013 Escape SE 4×2 – 2.0L Ecoboost, Trailer/tow pkg! MSRP $26,560. Sale price: $17,500. Save $9,060! 2012 Focus SE Hatchback – #2083 Auto trans, only 11k miles! MSRP $20,780. Sale price $12,900! Save $7,880! 2010 Fusion Hybrid – #7540A Leather, Moon, Navigation, remote start! MSRP $34,080 Sale Price $11,500 = total savings $22,580! 2013 Explorer Limited 4×4 – #P2102 Leather heated, Sony Audio! MSRP $40,295. Sale price $29,900! Save $10,395! 2013 Explorer 4×4 Base – #7445A Certified Pre-owned 12/12! Trailer/tow pkg! MSRP $31,635. Sale price $23,900. Save $7,735! 2012 F-150 XLT – #7625A Certified pre-owned 12/12 warranty! Brand new tires! MSRP $37,740. Sale price $27,900! Save $9,840! 2011 F-150 Supercrew XLT 4×4 – #7576A Chrome and convenience pkg! MSRP $40,225. Salve price $22,900! Save $17,325!